Adam Fire Fist Shows No Mercy!!! : Team of two. Well, it was a good trip home. 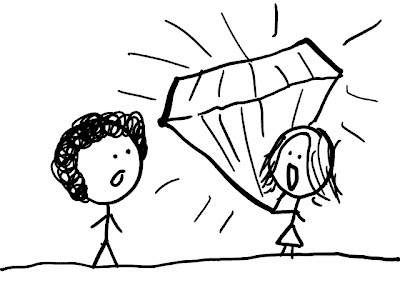 Rebecca was in New York for ten days, then ten days in Newfoundland where I finally screwed up my courage and asked Katie if she wanted to get married. Are you ready for some super-cute photos? Brace yourselves. So, there was a whole super-secret plot that my dad, stepmom, and sisters were involved in to just get the ring in the first place. Then we went out to Bowring Park to "take a picture with the Peter Pan statue." We stopped under the weeping willow near the Bungalow (which Katie stubbornly insisted wasn't actually a weeping willow), and I took the opportunity to ask her. 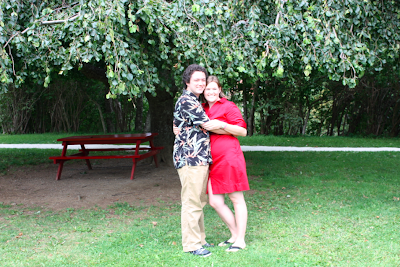 And here we are, slightly overexposed under the willow (or whatever the hell it is). Looks like Friday, August 20, 2010 is the date for the thing. Yes, b'y. Well, there you have it. A wonderful marriage of convenience love. No snotty little quote this time! I only know you from M King's blog in Korea, but congratulations! That's great... you guys are the cutest couple. Where will the wedding be? 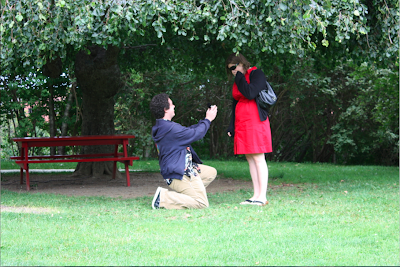 I hope everyone sees how awesome it is that you are wearing your Cornel sweatshirt when you asked her to marry you! YAY!!! So happy for you guys! Hey! Awesoommeeeeeeee!!! Yay!!!!!! Congrats and happiness! We're so happy for you and Katie. And no, that is not a willow tree. I mean, where is Val Kilmer? Brian: Thanks! I've read your name several times on Melissa's website and occasionally clicked through to your base on the interwebs. Regan: Yes, we are right adorable. We're getting married in true Townie fashion, in St. John's at the bungalow in Bowring Park. Sabra: Yes, that was perhaps an oversight on my part, but funny nonetheless. Melissa: We love you, too. Start saving those won, missy.